We expect every student who starts with us to see positive results. If you do not observe changes or if changes in reading are not picked up in our testing over a six-month minimum period of Fast ForWord, Gemm will provide an alternative — BrainWare Safari — free of charge for three months. Our goal is to make a difference in your child’s life. To that end, in the unlikely event that Fast ForWord software does not help, BrainWare Safari is a great alternative because it targets learning in a very different way. 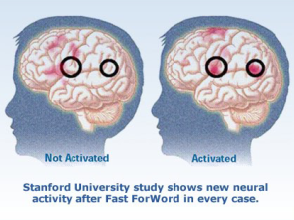 While Fast ForWord works primarily on processing skills, BrainWare Safari uses sensory integration and cognitive loading to build learning efficiency. This pre- and post-fMRI chart is why. We know for sure that the software always activates new neural pathways, just as physical strength training always builds muscle mass. The open question is how these underlying improvements in brain function manifest themselves in learning and reading skills. And so we guarantee that you will see improvements. Our confidence in Fast ForWord has only grown since we started providing the software in 2006. Parent observations in emails or by phone. We hear from excited parents all the time, and that is what we expect.